Considering we don’t have the Nintendo Switch just yet, we’re trying to figure out ways to keep ourselves occupied until we are able to get one. 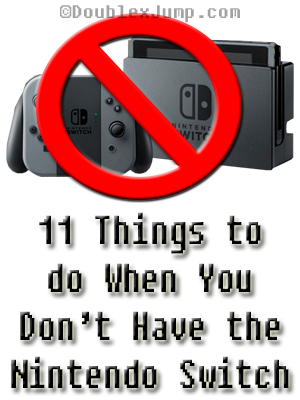 Here’s a silly little list we complied as a way to cope. If you’re in the same boat as us, let us know what you’re doing to pass the time until you can get a Switch console in the comments below! 2. Do a puzzle, preferably one of your favorite video game franchise. 3. Create an Amazon wishlist of all the Switch games you’re going to get once you have the console. 4. Count your money and don’t let go. 6. Watch old video game TV shows (Mario Bros or Legend of Zelda) or movies (Super Mario Bros or Professor Layton). 7. Constantly refresh the Amazon and Gamestop homepages. 8. Buy some Switch accessories that you’ll need for when you get the console. 9. Play games you already have and forgot about already. 10. Go for a walk (the sun can’t hurt that badly, right?). 11. Buck up and realize it’s just a video game console — you’ll get one eventually! Ah, but there’s the challenge in finding a Switch, haha! It’s sold out everywhere. There’s nothing we can do. I’m on multiple steps. Some days I shrug and say we’ll get it when we get it and other days I’m angry and other days I’m sad, lol. I hope you get it soon! Doing a Zelda puzzle sounds like a lot of fun. I’m impressed by the one you were working on!